Mr. Joseph Donald Lucas, 64, of Elizabethtown, KY died on July 15, 2018 at Hardin Memorial Hospital. Mr. Lucas was a native of Wake County, NC and the son of the late William Lucas and Etta Mae Lucas. 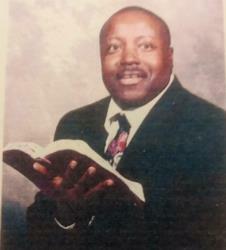 He was a member of All Nations Worship Center and retired from the U. S. Army. He was preceded in death by his father, Williams Lucas and one grandson, Mar'riel Lucas. In addition to his mother, survivors include his wife, Deborah Lucas of Elizabethtown, KY; one son, Joseph Lucas, II (Cynthia) of Louisville, KY; two daughters, LaToya Lucas (Jonathan Hall) and Danielle Lucas both of Elizabethtown, KY; two brothers, Wilburt Lucas of Apex, NC and Edward Lucas (Deborah) of Fuqay-Varina, NC; three sisters, Mabel Norris (Bruce) of Willow Spring, NC, Wilma Mangun (Herman) and Sharon Lucas both of Angier, NC and two grandchildren, Jeremiah Latimer of Ft. Riley, KS and Neymar Lucas of Elizabethtown, KY.
Funeral service is Tuesday, July 24, 2018 at 10:00 am at St. Stephen Church in Radcliff. Burial will follow at Kentucky Veterans Cemetery Central in Radcliff, KY.
Visitation will be from 6:00 - 8:00 pm on Monday, July 23, 2018 at Percell & Sons Funeral Home. You are in GOD Grace. You are in GOD's Grace. He was a great man and a very well respected friend. I'll miss him. To the Lucas Family....our sincere sympathy for the loss of your love one. We will always remember Mr Lucas as a friendly neighbor, and religious man. May God bless you all. My deepest condolences to Deborah, his wife and good friend, and his family. He will be greatly missed but remembered as a great man of God! Thinking of you and your family during this sad time and sending our deep sympathy for your loss. Daily may God (Ps.147:3) give you the needed comfort and strength. He will be sadly missed.